This blog focuses more on the Knowledge of Tawheed.The Message of every Prophet. »Arabic»Madinah Book 1-Class 10 Notes by Ustaadhah Sameerah Al Harbi. Madinah Book 1-Class 10 Notes by Ustaadhah Sameerah Al Harbi. Book : Madinah Book ONE. 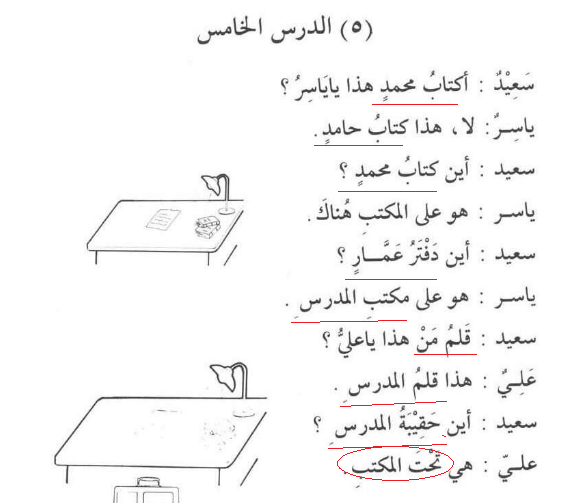 Teacher : Sameerah Al Harbi. (مُعَرَّفٌ بِ (ال : The noun which is definite having ال التعريف. We have to discuss the last sentence which says, ”هي تحت المكتب ”. (It is under the desk). 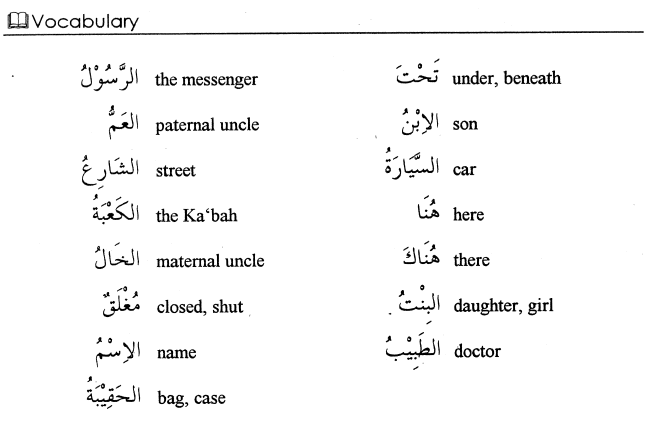 Here, هي refers to , ”حقيبة المدرس”. In ”هي تحت المكتب ” notice the word, ”تحتَ” (Under). 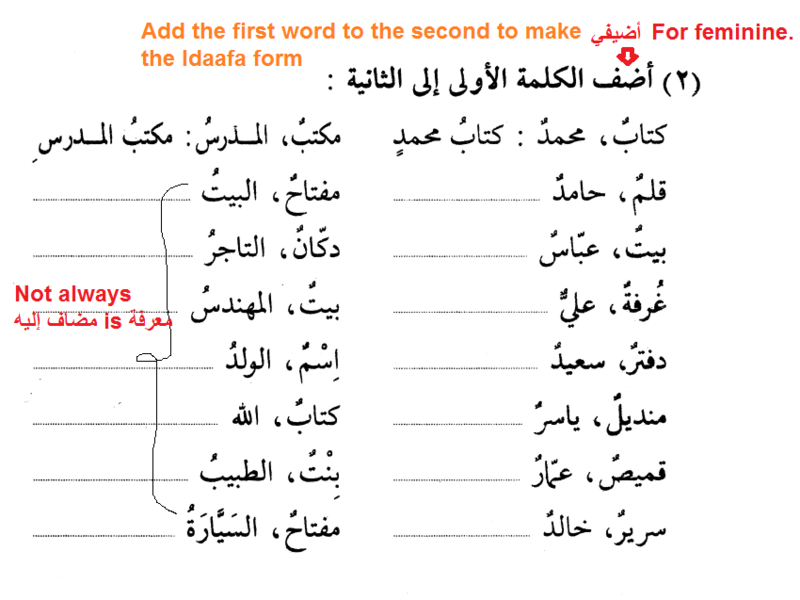 We have two types of الظرف which are : 1) ظرف المكان (Adverb of Place) . 2) ظرف الزمان (Adverb of time). Here, ”تحتَ” (Under) is ظرف المكان (Adverb of Place). تحت المكتب is شبه جملة (Phrase). Here, we have two خبر . Sometimes الظرف is followed by مضاف إليه but its NOT ALWAYS. Here, ”تحتَ” is مضاف and المكتب is مضاف إليه . الظرف is by default منصوب . In all underlined words we are using إضافة to make it معرفة but in this ‘هي تحت المكتب we just used مضاف إليه to clarify because if we removed المكتب the word تحتَ’ having end harakah as fathah stays same. But, as for other examples will get tanween. Notes by Ommo ‘Abdillah Al -Baakistaaniyyah. Duroos of Madinah book 1 – by Ustaadhah Sameerah Al Harbi. Please can you also put notes of the remaining chapters. These notes a e very beneficial .. Or if you can guide source from where i can get the notes of teacher Sameera please. 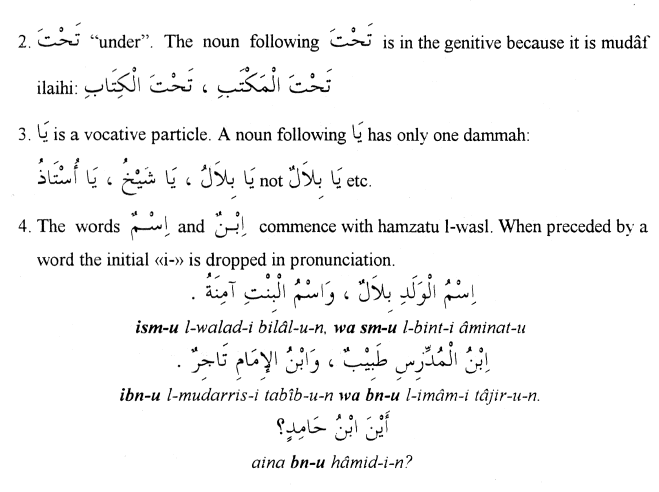 Difference between a Mu’jizah (معجزة ),a Karaamah (كرامة), and Kahaanah(كهانة).